Versions of name: Monrepos, Krīdenera muiža? Year of construction: 18th c.? Manor house has not been preserved. Name of the nearby Palmu Street comes from the owner of manor Palm. Properties extended up to Brivibas Street 237, 251, 253, 255. In the work of J.C.Brotze (1., p.102.) 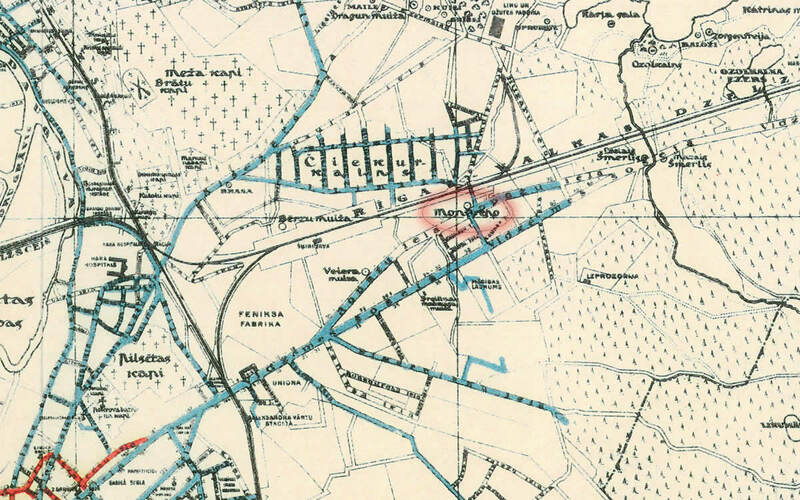 there is included map where approximately in this area there is marked Kridener manor. Broce J.K. Zīmējumi un apraksti, 2.sējums, Rīga, Zinātne, 1996, p.102. Enciklopēdija Rīgas ielas, 2.sējums, Rīga, 2008, p.120.